At the bottom of this page there is a comments box – please give your feedback on the contents of this page (and site) and by all means please submit any related questions that you have. We will endeavour to answer your questions. 1. When will I get my biometric residence permit (BRP)? 2. 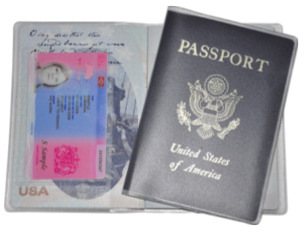 How do I get into the UK without my biometric residence permit (BRP)? 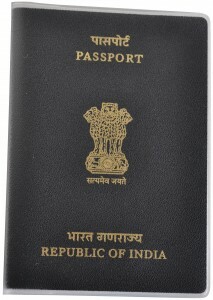 If you are successful with visa application, you will be issued with a vignette which will be endorsed in your passport. The vignette will be valid for 30 days from the date of travel you indicated as your intended date of travel in your visa application form. The vignette is proof only that you have permission to enter the UK. 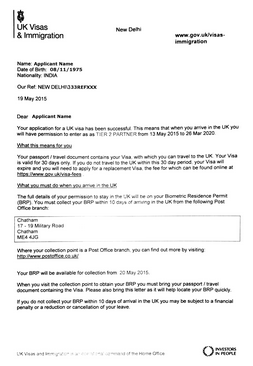 If you do not travel to the UK within the validity of your visa (i.e. 30 days), you will need to apply for another 30 day visa. You will have to pay a fee for this. In addition to the vignette you should also be issued with a decision letter indicating which Post Office you should attend to pick you your BRP. Your full leave (i.e. authorisation to work) will be display on your BRP. 3. 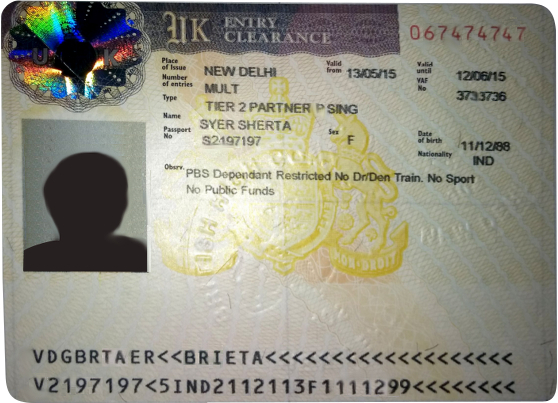 How to I get my biometric residence permit (BRP)? You must collect your BRP within 10 days of arriving in the UK from the Post Office branch indicated on your decision letter. If you do not collect your BRP within the given time frame you could be subject to a financial penalty or cancellation of your leave. The Home Office will allocate a particular Post Office based on the address entered on your visa application form. You are strongly advised not to book any travel before you are in possession of your BRP. 4. How do I collect my biometric residence permit from the Post Office? The decision letter which you will get with your visa will tell you the date from which your BRP will be ready from for collection as well as the address of the Post Office branch holding your BRP. The date and the address are both based on the information you entered on your visa application form. You will not need to make an appointment to collect your BRP. 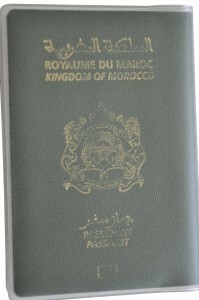 When you attend the Post Office to collect your BRP, you must bring with you the passport in which your visa has been endorsed. You should also bring your decision letter with you so that to help the Post Office staff finding your BRP quickly. 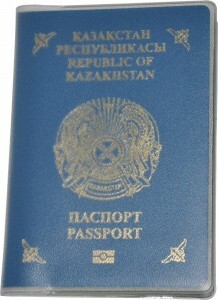 If you fail to bring your passport, you will not be able to collect your BRP. 5. I have lost my decision letter and do not know which Post Office branch I am expected to collect my biometric residence permit from, what do I do? 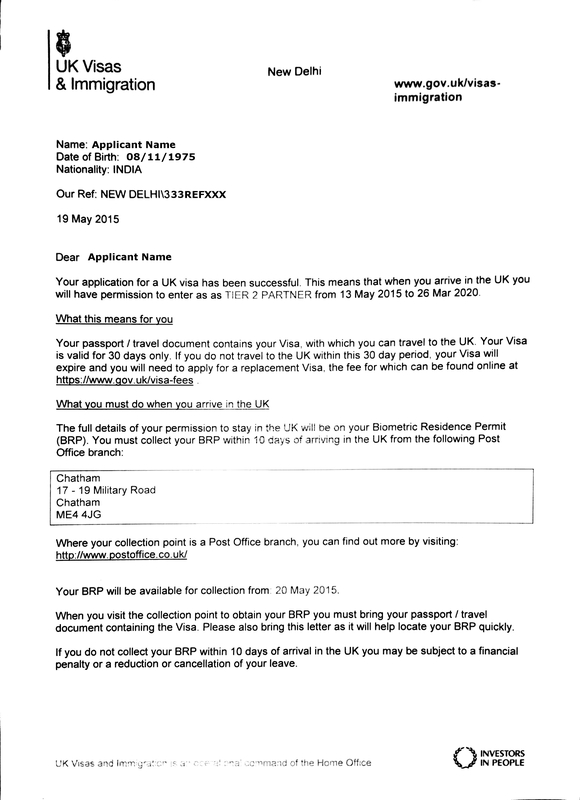 You must send an email to BRPCollection@homeoffice.gsi.gov.uk stating: – your full name, date of birth, nationality, passport number, contact telephone number and case reference number. 6. May I collect my biometric residence permit from a different Post Office branch to the one indicated in my decision letter? Yes you may do so. You will have to go to the Post Office branch from which you wish to collect, talk to their staff and ask for your BRP to be re-directed. You will have to pay a fee for every permit, which are re-directed. Not all branches will offer this service. 7. I have lost my passport after entering the UK but before collecting my biometric residence permit. What do I do? 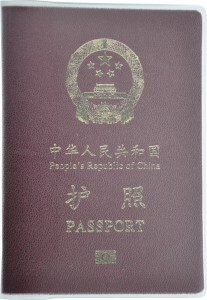 passport was lost; the date the loss was reported to the Police; a contact telephone number and your case reference number. The Home Office should contact you within 5 working days from receipt of your email. You should not try to collect your BRP until you have been instructed to do so by the Home Office. 8. Could someone else collect my biometric residence permit on my behalf? You are under 18 and cannot collect your permit at the same time as your parent or legal guardian collect theirs. 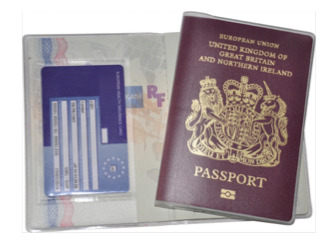 The person collecting on your behalf will need to provide your passport and evidence of their own ID via their passport, UK issued driving licence, European national ID card, UK issued biometric residence permit. 3PartyCollection@homeoffice.gsi.gov.uk stating the following: your full name; your date of birth; your nationality; your passport number; the reason as to why you need someone to collect on your behalf; a contact telephone number; your case reference number; and your vignette reference number, which is to be found on the top right hand corner of your visa. You will also have to provide the person collecting’s details: their full name, date of birth, nationality, the type of document they will present to confirm their ID, the ID document’s reference number; the ID document’s expiry date and the person’s email address. If the Home Office views your request favourably, the person you have chosen to collect your BRP on your behalf will get an authorisation email. They will need to present the said email on collecting your BRP. 9. Can I collect my accompanying family’s BRPs on their behalves? Yes ,as long as you have travelled to the UK together as a family group and you are an adult, you should be able to collect the BRPs on behalf of all your family members. You need to make sure that the link to the main applicant is shown on all the vignette i.e. dependant of James Gordon. The adult collecting the cards will have to present the family group’s passports (endorsed with their respective vignette). 10. Can I start work before collecting my BRP? If you are allowed to work in the UK, the Home Office strongly advise you to collect your BRP before you start work. However if you need to start your employment prior to collecting your BRP, you should be able to show your ‘right to work’ by presenting your vignette in your passport to your employer. Once your vignette has expired you will not be able to continue working until you are in a position to present your original BRP to your employer. 11. 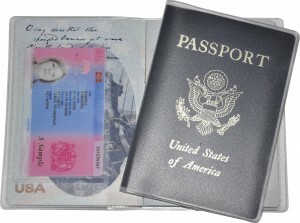 Must I carry my BRP with me when I travel overseas? Yes as you will need to present it to the Immigration Officer at the port of entry together with your valid passport when you re-enter the UK. Although your BRP is proof that you are entitled to re-enter the UK, it does not replace your passport or travel document. 12. I have lost my biometric residence permit, what do I do? 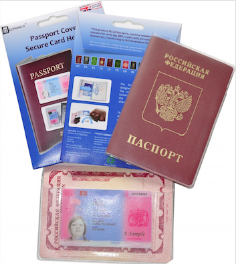 You will need to provide the following details: – full name; – date of birth; – nationality; – passport number; – contact details;- BRP reference number;- case reference number; and – when, where and how the loss or theft occurred. You must also have to report the loss or theft to the police and obtain a police report and a crime reference number, as soon as possible. If your biometric residence permit is lost or stolen while you are in the UK, you will have to apply for another permit within 3 months of reporting the loss or theft of your original biometric permit, using the form BRP (RC). If your permit is lost or stolen while you are outside the UK, you will have to apply for a Replacement BRP visa in order to be able to return to the UK. Then you will have to apply for a new biometric residence permit within 1 month of returning to the UK. If you do not apply for a replacement permit, you may have to pay a financial penalty of up to £1,000, or the Home Office may shorten your permission to stay. 13. I have just got married and changed my maiden name. 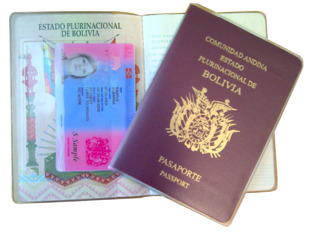 Can I change my personal details on my biometric residence permit? The Home Office advise that BRP holders must inform them as soon as possible when there a change of name, gender, nationality, facial appearance if changes significantly. 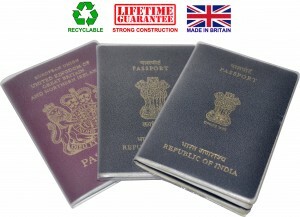 So if you have changed any personal details listed above or any details shown on your biometric residence permit, you have to apply for a new permit within three months, using application form for no time limit (NTL) for those with indefinite leave to remain or an application for transfer of condition (TOC) for those with finite leave to remain. If you do not do this, you may have to pay a financial penalty of up to £1,000 or the Home Office may shorten your permission to stay. I have lost my job/ I have changed my course. Do I need to tell the Home Office? The Home Office advise that if your circumstances change you must inform immediately. This would apply if you no longer qualify to stay under the Immigration Rules that were in place when the Home Office gave you permission to stay in the UK (for instance you are no longer working for your Tier 2 sponsor or if you are a student you have changed your course and/or education provider /sponsor). The Home Office state in their guidance that it does not matter whether they are currently deciding or have already decided your application. You must always to tell them of any changes, by completing a Migrant Change of Circumstances (MCC) form. 14. The information on my biometric residence permit is incorrect. Someone else has been using my permit. My permit is damaged. What do I do? 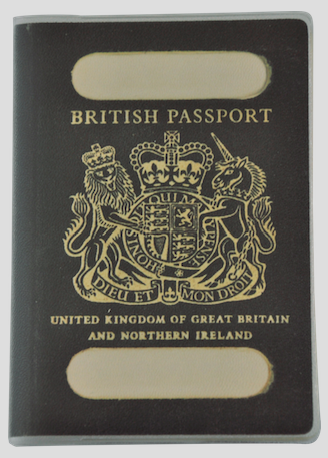 You will have to provide them with: your full name; date of birth; nationality; passport number; a contact telephone number; BRP reference number; case reference number; and details of what has happened to your BRP (for instance the Immigration Officer was not able to scan it when you went through immigration on entry into the UK. 15. I am an employer/sponsor, how does the introduction of biometric residence permits change what I do when carrying the right to work check? – check the sponsored migrant’s immigration conditions on both the front and the back of the permit. – The date of birth as it appears on the rear of the card. The Home Office should return all checks within 6 working hours (08:00- 17:00, Monday to Friday, except bank holidays). When the check has been completed, the Home Office will send you a certificate to the email address you give them. This will tell you if the biometric residence permit is valid and give you the ‘right to work’ status of the person. A sponsored migrant can start work prior to collecting their BRP. They will be able to evidence their right to work by presenting their short validity vignette visa, which was endorsed into their passport. A right to work check can be carried out on the basis of the vignette. You must ensure that you conduct another right to work check on the basis of the migrant’s BRP, once the vignette in the passport has expired at the latest.